Cama Hotel serve their guests with a unique blend of homely environment, charming ambiance and aristocratic amenities. The hotel is located at a distance of 3 km from Kalupur Railway Station. It offers facilities like Wi-Fi, business center, car rental, currency exchange, doctor on call, credit card facility, airport transfers, laundry, parking and many more.The hotel features board room, ball room, meeting rooms to fulfill the needs of corporate travelers. There are beautiful outdoor venues where guests can host celebratory events. The in-house multi cuisine restaurant overlooking the sabarmati river sets as an ideal venue where patrons can savor their favorite delights amidst the warm ambiance. Travelers can halt for a refreshing cup of coffee at the on-site coffee shop.Guests can take a dip in the swimming pool and come out feeling refreshed after a tiring day. Fitness lovers can start their day at the gym and enjoy their workout. 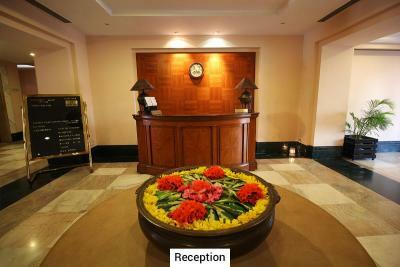 The friendly and modest staff ensures that guests rejoice every moment spend in the hotel. This edifice is located at a distance of 9 km from Sardar Vallabhbhai Patel International Airport.Guests can spend some time with loved ones and learn about the intriguing past by visiting the famous tourist places in and around the city. Prominent tourist spots that guests can explore are Sidi Saiyed Mosque(1 km), Hathising Jain Temple(2 km), Gandhi Ashram(5 km), Law Garden(5 km), Iskon Temple(10 km) and many more. Shoppers can have fun-filled shopping experience at nearby mall. The travel desk at the hotel assists in planning a trip to nearby tourist attractions.The rooms are cozy cocoons of luxury designed with elegance to offer a relaxing experience to guests. They display a blend of warm allure, combined with the most contemporary luxuries. They are equipped with television, air-conditioner, work station, electronic safe, direct dial facility and tea/coffee maker. Guests can enjoy fresh air and beautiful outside views right from their rooms.Experience a wonderful stay at Cama Hotel. Cama Hotel Ahmedabad is known for traditional hospitality. Avail best deal in Cama Hotel, Ahmedabad. Book room in Cama Hotel, Ahmedabad and avail contemporary amenities.